Long considered the capital of Jewish America, this overpoweringly cramped neighborhood was considered by many to be the greatest concentration of Jewish life in nearly 2,000 years. Between 1880 and 1924, 2.5 million mostly-impoverished Ashkenazi Jews came to the US and nearly 75 percent took up residence on the Lower East Side. According to the Library of Congress, by 1900, more than 700 people per acre were settling in a neighborhood lined with tenements and factories. 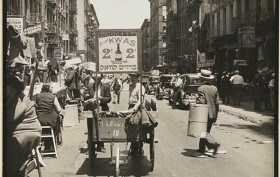 And as quickly as they descended on the streets, all sharing a common language (mostly Yiddish) and most certainly, similar backgrounds, they quickly established synagogues as early as 1865 (the landmarked Bialystoker Synagogue, whose congregants were mostly Polish immigrants from Bailystok), small shops, pushcarts teeming with goods, social clubs and even financial-aid societies. By 1910, the Lower East Side’s population was well over the five million mark, but sadly, such congestion habitually caused havoc.